Iconic symbols of the city, dating back to the 12th or 13th century, there were once as many as 180 towers. We’re not in Kansas Roma anymore. We stepped off the train in Bologna (pronounced “bow-LONE-ya”) and I thought perhaps we had left Italy entirely. 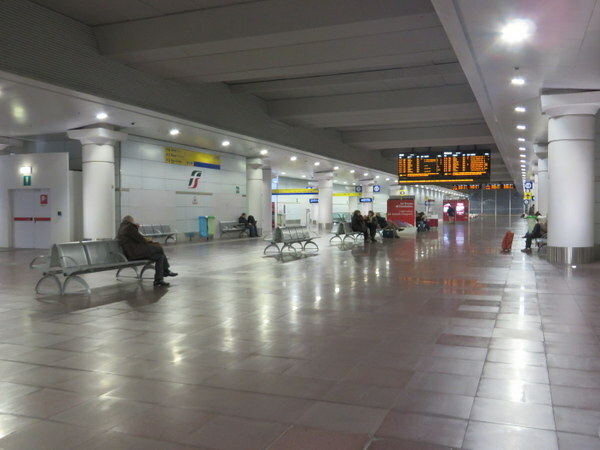 In fact it looked like we had arrived in a newly constructed airport facility, but we were in the new “High Speed Bologna Centrale.” There was a noticeable freshness to the facility, good signage, wide walkways, no cigarette butts, and plenty of escalators: until we reached the end of the new facility and had to lug our cases up a steep flight of depression-era station steps. Bologna’s high-speed train terminal. Clean, bright, chairs available! We’re not in Roma any more. 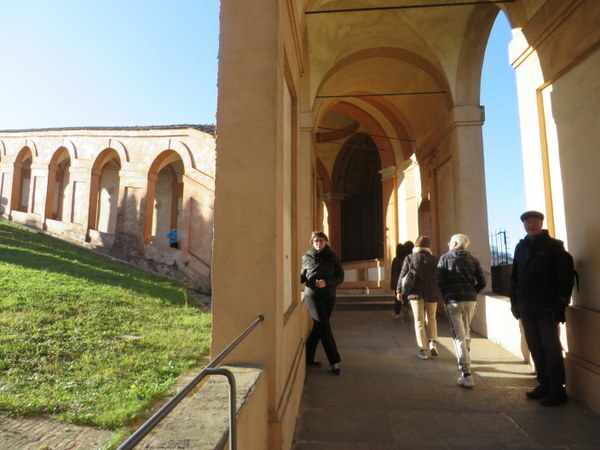 The differences between Bologna and Roma continued to astound us. Beautiful porticoes dating back centuries separate pedestrian traffic from automotive. Clean streets, no overflowing waste bins. People walk in more-or-less straight lines and keep to the right except to pass. Oncoming pedestrians do not block the sidewalks: they make way for you! This is truly not like Roma, where walking down the sidewalk is like a game of chicken and when you swerve to avoid an oncoming body, you may very well step in dog poop. 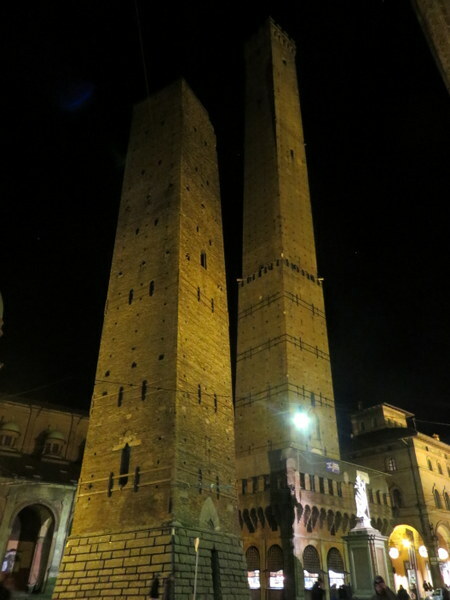 Bologna is a lovely city if not one full of E-ticket sites. Sitting in the bread-basket of Italy, it is known for its cuisine and we worked hard at sampling as much of that as possible. Another notable difference in Bologna: little or no double-parking and no one parks in the pedestrian crosswalks. In Roma there is hardly a pedestrian crosswalk that has not been turned into parking. 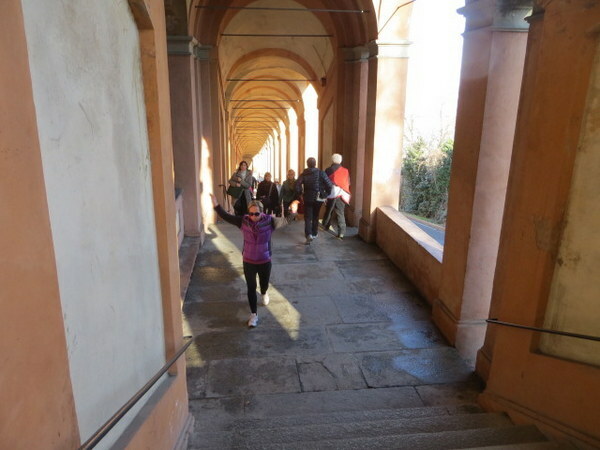 We had lovely weather, so rather than spend time indoors, we took a phenomenal urban trek, the Percorso della Madonna di San Luca. This is a walk of about 4 km (2.4 miles), 2.3 km of which is steadily uphill. 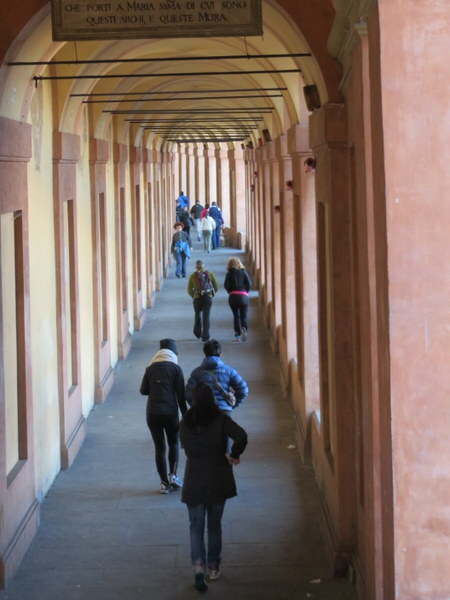 The walk is entirely covered by the famous porticos of Bologna, and is the longest continuous section of portico-covered walkway in the world. There are 666 arches. In that final 2.3 km, the altitude gain is a respectable 722 feet (220m), a workout indeed! We were impressed by the number of people doing the percorso on a cold but sunny Sunday. Afterwards we of course rewarded ourselves with a fine tagliere and wine, accompanied by a salad for the health of it. Many run up the 2 km. to the sanctuary. Show-offs. Interesting view showing inside and outside of the world’s longest covered walkway. Not only does the path go up over 700 feet in altitude over 2.3 km, there are in excess of 300 stairs. Ugh! 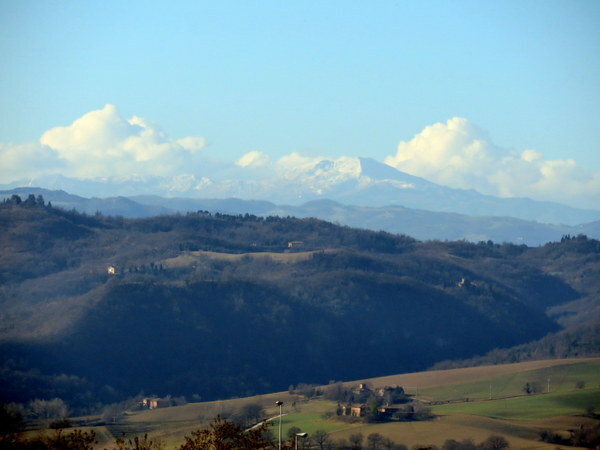 A view from the sanctuary looking toward the mountains of Emilia-Romagna. A typical Bolognese “tagliere” or cutting board of assorted salumi. Mortadella on the left. Street performers are everywhere in Italy. 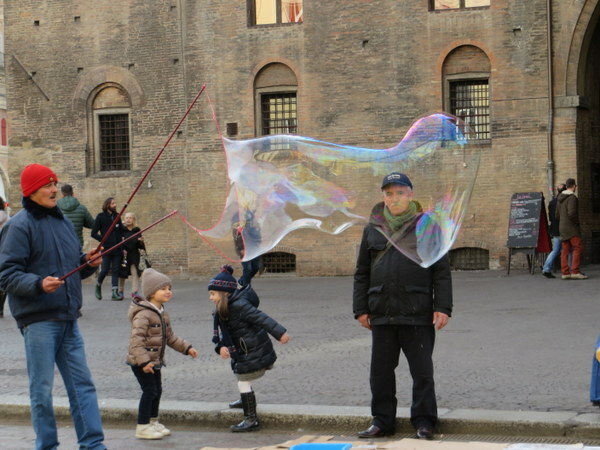 Bologna is the first place we have seen bubble blowers. Kids had a great time running after them. 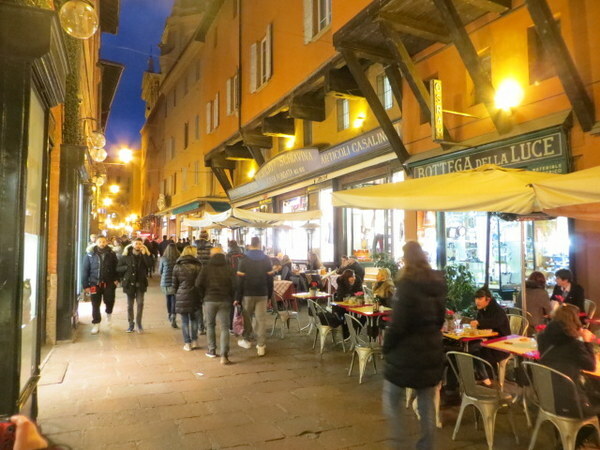 Aperitivi are a huge thing in Bologna, like in Milano. The cafes are crowded even in winter. The only fault we found with Bologna is that it’s a little lacking in charm. The porticoes that are elegant also make for a sameness. (Actually there was a second flaw: people still do not scoop the poop.) We will be back in June on a trek through the area, heading to the hills outside of Bologna for some hiking. We’ll see what she’s like in summer when the trees and flowers are blooming! N.B. – I have decided to use Italian city names from now on, therefore Roma and Firenze not Rome and Florence. I think it is rather bizarre of any language to change a perfectly pronounceable city name from the original language, an idiosyncrasy driven home to me when my hometown of St. Paul Minnesota was referred to as “Sao Paolo” by an Italian bureaucrat. ← Goodbye 2014, Hello 2015! Hey Laurel – I love the updates! Ciao Carol! Nice to hear from you! It is amazing you can go to another city in the same country and it has a totally different ‘set of rules’ evidently (clean, neat…etc). The food pictures look lovely. Sí, Marcia! But Italy is not really one country: it is a collection of regions. Garibaldi famously said upon the unification, when Italy became a country in 1861, “We have created Italy; Now we must create Italians.” The food was great! It’s pretty darn great everywhere in Italy! 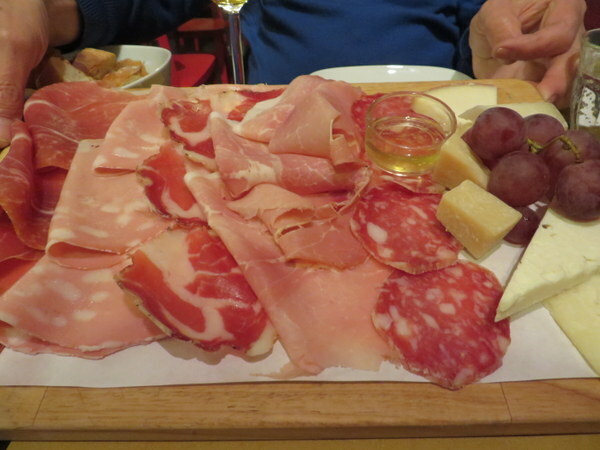 What a great introduction to Bologna! And very useful as I’m planning to go to Bologna next month! Great photos too! So where’s next? Hi Liz. Thanks for the comment. We are off to Montepulciano in February. Off-season, new wines released in January, no crowds (I hope!). Hi Laurel. Glad you enjoyed Bologna. Yes, you’re right about the charm factor. But what it lacks in the tourist charm of Venice, Rome, Florence, etc., it more than makes up with the “localness” charm we enjoyed during our visit in October. It was also a great rail hub to tour many of the nearby towns. The annual Mortadella Festival was underway during our visit. Like you, mortadella/bologna is not my thing, although it was fascinating to see wheels of mortadella that were two feet in diameter! Hey Will! Now you’ve got Ric excited about the Mortadella Festival. We may have to go in October!